Wondering, what I have been doing the last few weeks?. GTK+ is the answer, GHangtux 1.0 the result, and since we all know that a picture is worth a thousand words I go just straight to the introductions: "World, this is GHangtux, GHangtux this is the world". GHangtux is a free program variation of the popular Hangman game. It has been designed for people of all ages and has a simple, easy-to-use interface. It provides a keyboard and a sentence/word to guess, whose theme, the player is able to select. Current themes are: films, objects and persons. 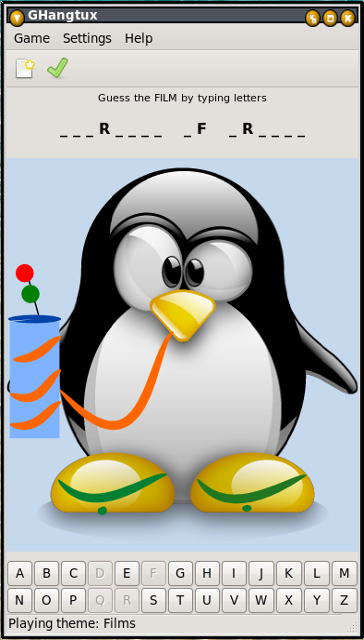 During the game, a graphic sequence of tux images will be displayed, indicating the player how many attempts he/she has left. How to "create life" from some code lines? 1. Getting familiar with GTK+. As I wrote in the last post, I spent my first weeks at Openismus learning GTK+ and to put this into practice, I worked in a very small but helpful project. "Foundations of GTK+ Development" was very useful in this learning process and gave me a good base. 2. Making and correcting mistakes. The next step was to learn about all those mistakes I made, to repeat them and to relearn from them again. This is part of every single step actually. 3. Testing the new knowledge. After the first two steps, it seemed that I was prepare to start my first simple GTK+ application which is the very early version of the game. 4. Creating a custom widget. After playing with GTK+ a few more weeks, I decided to create my own custom widget: the game's keyboard. For this step, I found Davyd Madeley's clock widget tutorial quite handy. 5. Integration of the custom widget in the early version of GHangtux. This is the last version of the game. - Shortcuts for the menus. "Side effects" of having developed GHangtux? - Learning Git and discovering how powerful this tool is. - Learning Autotools helped by Alexandre Duret-Lutz's tutorial, and some Openismus manuals. - Improving my communication skills. You can follow the project under the repository in GitHub or download it in .tgz or .zip. All comments are welcome, as are merge requests. http://github.com/Patriciasc/GHangTux/blob/master/src/main.c#L367 - shouldn't the path returned by get_system_file be freed somehwere? It's build via g_build_filename, but only freed if the the file *doesn't* exist. http://github.com/Patriciasc/GHangTux/blob/master/src/main.c#L463 - the code in every case looks very similar. could be moved to a function? http://github.com/Patriciasc/GHangTux/blob/master/src/main.c#L504 - not really random =) or at least not equi-distributed. consider a file with MIN_RANDOM + .5 * MAX_RANDOM entries - chances to get a non-exisiting entry on the first try is roughly 50%. In that case, the impl will rewind to the last entry. But perhaps I misunderstood the code.